“Libraries, the best of our ‘social infrastructure’” is the theme of this year’s #FFBPLGivingTuesday campaign sponsored by the Friends Foundation of the Birmingham Public Library. #GivingTuesday, a date to support nonprofits in our community, is November 27, 2018. “Social infrastructure” is a term coined by Eric Klinenberg, a sociology professor at New York University, who has written the book Palaces for the People: How Social Infrastructure Can Help Fight Inequality, Polarization, and the Decline of Civic Life. His definition of the term is “the physical spaces and organizations that shape the way people interact.” In an opinion piece for the New York Times, he describes why libraries are a crucial part of our social infrastructure. The professor points out that, while libraries are routinely being starved for resources, their usage is actually increasing. The real problem that libraries face is that so many people are using them, and for such a wide variety of purposes, many library systems and their employees are being overwhelmed. One major roadblock to the appropriate funding of libraries is that too many influential people are not aware of the expansive roles that libraries play in modern society, roles essential not only for neighborhood and community vitality, but also for helping to address all manner of personal problems for individual citizens. The branches and Central library of the Birmingham Public Library System, as well as the other member libraries of the Public Libraries of Jefferson County, fulfill the roles the professor describes in his book. Our libraries are places for culture and company, especially for those who are retired or who live alone, through book clubs, movie nights, craft circles, and classes in art, music appreciation, and current events. For many patrons the library is the main place they interact with people of a different generation, social background, economic status, and ethnicity than their own. Libraries all over our county serve as polling places, accommodate neighborhood and community meetings, provide various business services and classes, and even accept and process passport applications. They sponsor lectures, recitals, art shows, and other cultural programs for free or at reasonable cost in a casual setting available to all, and rent spaces for private use. Further the many online services provided by libraries are available 24/7 for free. The Friends Foundation of the Birmingham Public Library encourages you to support your neighborhood and community libraries through advocacy and donations regardless of where you live. 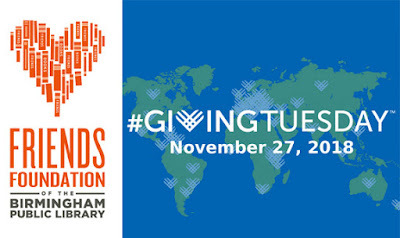 It also invites your financial support this #GivingTuesday for the Birmingham Public Library specifically. Because the Central Library of BPL is the headquarters library for our countywide library cooperative, it is the beating heart of the whole system. And its Linn-Henley Research Library is a countywide resource, housing the Archives and Southern History Departments as well as offering the genealogy programs and resources unique to BPL. Below is just a sample of the many classes, workshops, programs, and events the Birmingham Public Library System offered the community in 2018. Use our Donate button and give generously!